This City on a Hill collection features artists Jars of Clay, Third Day, Sixpence None the Richer, Caedmon's Call and Derri Daugherty (The Choir), Paul Colman Trio, Sara Groves, Julie Miller (Buddy and Julie Miller), Out of Eden, Michael Tait (dc talk, Tait) and Terry Scott Taylor (Daniel Amos, Lost Dogs). 11 songs, including: Babe in the Straw * Bethlehem Town * Do You Hear What I Hear? * Manger Throne * O Holy Night * Silent Night * and more. More than just a folio, this is a worship resource kit! Includes: piano/vocal sheet music, guitar sheets, plus transparency and Power Point masters on CD-ROM. 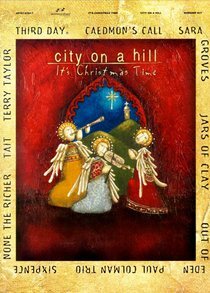 About "City on a Hill: It's Christmas Time (Music Book)"